Bruce Wayne is initially reluctant to help the city of Gotham in it's struggle against the new villain. Anne Hathaway slips effortlessly into her first femme fatale role as Catwoman. Fox gives Batman's rides some cool new bells and whistles. Four years later and Christopher Nolan does it again. The Dark Knight Rises hit theaters July 20 as one of the most anticipated movies of the year. If you’re a nail biter, wear gloves, because this movie is a sensational, thrill-a-minute adventure . Nolan creates yet another dark third movie in his amazingly directed trilogy. This time around, there are new characters, plot twists, and non-stop action. Nothing is predictable. Anne Hathaway slips effortlessly into her first femme fatale character as Catwoman, and adds a very playful feel to the movie. Admittedly, I am jealous of her sneakiness, skills and catlike reflexes, never mind that she looks amazing in a very unforgiving catsuit (In fact, Hathaway portrayed Catwoman so convincingly, there is talk of a Catwoman spinoff). Bane, played by Tom Hardy, the last villain of the franchise, keeps the dark theme going. Between his overly muscled bod, demonic sounding voice and penchant for killing, frankly, I was little scared. The thought of running into Bane in a dark alley really gives me the creeps. His evil plan to take over the city of Gotham is a constant battle for the entire police force and, of course, Batman himself. Bane’s intense character makes this movie feel dark and frightening; only Heath Ledger’s performance as the Joker can out-evil this antagonist. 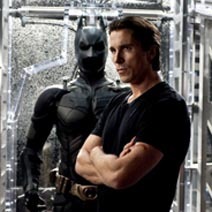 Christian Bale plays the tortured hero to a tee. Initially, Batman is reluctant to help the city that labeled him a rogue criminal, but it wouldn’t be the Batman we know and love unless he was fighting the bad guys. Despite Batman’s ruined reputation after the events of The Dark Knight, where he took the blame for Harvey Dent’s crimes, Batman feels compelled to aid the police force of Gotham and put an end to Banes’ disastrous plans. Bruce Wayne is embroiled in a painful psychological and moral dilemma: agonizing over how he’s been treated and what he feels is his duty to his beloved city. Wayne finally comes to the conclusion that he can indeed help the people of Gotham. Every character in the movie has a deeper, internal struggle between good and evil, right and wrong, duty and desire. The action and special-effects make you feel as if you’re right there alongside Batman, fighting crime in the streets and zipping around on the Bat-Cycle. This time around, Fox, played by Morgan Freeman, Batman’s tech guru, helps create a new and improved bat-mobile that allows our superhero to be faster, stealthier and more superheroish than ever before. Batman’s souped-up ride allows him to fly through the city of Gotham, cutting in-between buildings and hovering silently. You know, like a bat. The mini love stories, the twists, the blood, the fights, the struggles and the conquests make this Batman movie one for the books. Thrilling doesn’t even begin to describe it. If you’re wanting to chill out, relax and take it easy at the theater, then this movie isn’t it. But if you’re in for the non-stop adrenaline rush that you would get from, say, bungee jumping for two and a half hours, then park yourself in a bucket seat (preferably of the IMAX variety), because you have just found your thrill.